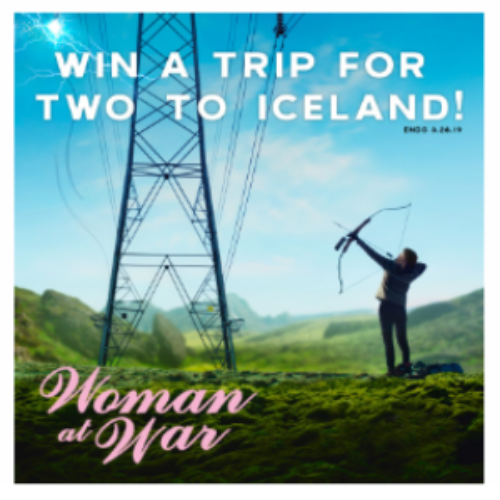 You can enter the Woman At War Sweepstakes from Landmark Theatres for your chance to win a trip for two (2) to Reykjavik, Iceland. The adventure includes roundtrip airfare, accommodations at Hotel Nordica, and two (2) 72 Hours Reykjavík Welcome Cards that grant you access to world famous thermal pools, museums and public transportation. You can enter by filling out the form or if you’re already signed up by sending them an email. See the offer for details. Entry ends March 28, 2019. I wouldn’t hold it against you if you weren’t terribly excited to rush off to Iceland. I’m pretty sure most of our northern denizens probably feel like they’ve been experiencing Iceland in their own backyard this winter. I noticed temperatures hit as low as -16°F in Chicago thanks to the Polar Vortex in January, and that’s not even accounting for wind chill. I have a bit of a theory myself that I formed after living in Southwest Florida for 10 years and then moving north to the Carolina’s. While it’s popularly accepted that there are 50 states in America, in my humble opinion there are only two. You have Florida, and then everything north of Florida, which I refer to as Alaska! I guess once your blood warms to tropical living, anything below 50°F feels like it’s freezing. With those jokes aside, I think this could be a really fun vacation to Iceland. Besides, the cold weather is what jackets were made for, right? Reykjavik is the capital city in Iceland and it’s cultural and economic center, making it a popular destination for tourists. It’s location includes unique geographic features such as coastlines of peninsulas and islands, beautiful rivers, and majestic mountain ranges hosting Mount Esja. The climate isn’t quite as extreme as it’s name implies, and while it rarely drives above 68°F, it’s also just as rare to be in negative digits in the winter. But you’re not hoping to win this contest to experience the weather. What you should really be excited about is the famous weekend nightlife, the cities cultural sites that include churches, museums, pools and even a geothermally heated beach. There’s a parliament building, a Viking excavation, and a forest and nature reserve. Reykjavik sounds like a beautiful place but I think Granny will leave this particular contest to my subscribers and fans to compete over, as I’m still trying to thaw out from winter. But I think this could be an exciting and invigorating vacation for one of you if you are lucky enough to be the winner. Best of luck my friends! How could did it get in your area this winter? Let us know in the comments below how chilly your area got during the Polar Vortex.